The services are based around protecting business owners from problems arising when the head of a business or a major shareholder faces personal issues such as divorce, critical illness or even death and include wealth management, succession planning, along with other business protection measures all wrapped up in a ‘Corporate Will’. We then marketed BPE At Work to businesses with more than 250 staff offering a three tier service; for employees, directors/senior managers and business owners. 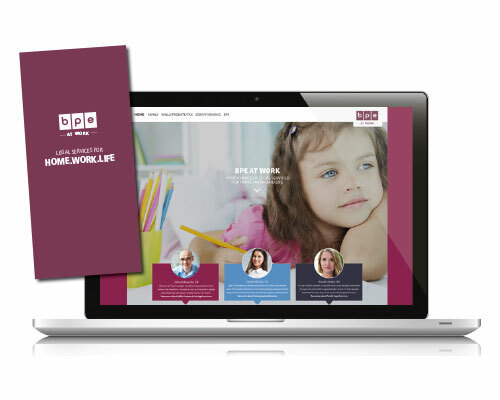 A dedicated website provides access to legal advice via an online portal, accessed directly by the company’s intranet and BPE offers monthly ‘drop in’ clinics. BPE At Work opened up a whole new sector of business for the Private Client teams as well as giving employers the opportunity to extend their employee benefit package to include confidential legal advice. It also gave BPE’s commercial teams something tangible to discuss with existing clients. My role: BPE at Work concept, creative & marketing strategy, copywriting.